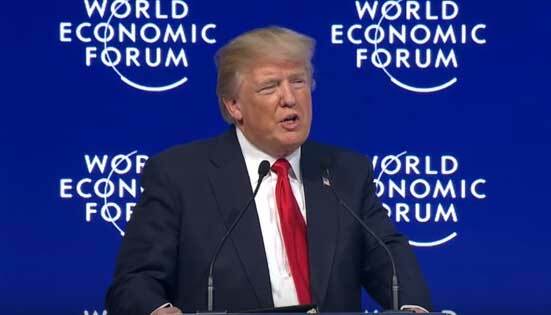 UNITED NATIONS, Jan 29 2018 (IPS) - When the World Economic Forum (WEF) concluded in Davos, Switzerland last week, the outcome of the annual talk-fest was seemingly predictable—plenty of unrestrained platitudes but, surprisingly, less of the American populist, protectionist rhetoric. Trump, who has increasingly opted for bilateralism over multilateralism — while pulling out of the 11-member Trans-Pacific Partnership (TPP) and threatening to do the same with the North American Free Trade Agreement (NAFTA) with Mexico and Canada– appeared more restrained before the world’s business elites, even though he arrived in Davos immediately after he slapped tariffs on imported solar panels and washing machines. But then appearances, as they say, can be frighteningly deceptive. Implicitly taking a shot at Trump, Indian Prime Minister Narendra Modi told the Davos Forum that “forces of protectionism are raising their heads against globalization.” Their intention is not only to avoid globalisation but also reverse its natural flow, he warned. He described the Davos Forum as a “speed-dating club for plutocrats and politicians”. But the idea that it will be a force for a more equal society is dead, he added. Last week, WEF boss Klaus Schwab embraced Trump, complaining that Trump’s “strong leadership” had suffered “misconceptions and biased interpretations”. Schwab, went further, praising Trump’s rushed and irresponsible tax giveaway to billionaires that is cutting services, increasing debt and widening inequality: “On behalf of the business leaders here in this room, let me particularly congratulate you for the historic tax reform package passed last month, greatly reducing the tax burden of US companies”. According to the New York Times, some in the audience booed at Schwab’s remarks praising Trump. Davos is now Trump-Davos: the racism and cruelty of Trump is forgiven, said Phillips. “And Trump became Davos-Trump: his claimed revolt against globalization is now exposed as merely an attack on poor migrants and not a challenge to the global elite. Goldman Sachs – once the target of Trump’s rhetoric but now the source of his key cabinet picks, was clear. They “really like what he’s done for the economy”, Phillips added. Jennifer Morgan, Executive Director, Greenpeace International, told IPS she saw no evidence that the corporate or government leaders in Davos really understood the urgent need to provide justice for the people or the planet. “While they speak of inclusive growth and climate action, they fail to investigate or challenge their own role in propping up and benefitting from the underlying system that has created the fractured world we live in,” she added. However, she said, she was inspired by many of the young global shapers, particularly women, whom she met, leading the way with big ideas and collective leadership. Morgan pointed out that climate risk and climate action were more present in discussions at Davos this year, but not at the speed or scale required when measured against the scale of the challenge we face. “Climate disruption is the new norm, which means a transformation of our energy and land-use systems is the only way forward,” she noted. Phillips told IPS it has not just the embrace of Trump, however, that has ended the myth of Davos as an equalizing force. It is the consistent failure of Davos to deliver. “For years now, Davos has listed inequality as a major concern, and yet has also noted that it keeps increasing. (Don’t these leaders have any influence? )”, he asked. As the world’s foremost expert on inequality trends, former World Bank economist Branko Milanovic, concluded last week, Davos has “produced 0 results” in lessening inequality – while the economy has been further adjusted by inequality-exacerbating policies that have returned us to the “early 19thcentury”. For students of history, noted Phillips, this should all be unsurprising: never, at any time or place, have great strides been made in tackling the concentration of power and wealth by a few by literally concentrating together those powerful and wealthy few. "All major equalizing change has involved a process of those outside the elite gathering together, building confidence and strength, and pushing for a fairer share. Greater equality has never been freely given, it has always been won through collective struggle." Indeed, all major equalizing change has involved a process of those outside the elite gathering together, building confidence and strength, and pushing for a fairer share. Greater equality has never been freely given, it has always been won through collective struggle, declared Phillips. Even the usually-restrained United Nations expressed concern over Trump’s call for countries to pursue their own self-interest – in this age of globalisation and multilateralism. Dandora in Nairobi is a slum situated on top of a garbage mountain, and it was there, not at the World Economic Forum, that NGOs, social movements and trade unions who have come together in the global Fight Inequality Alliance centred their organizing. Dandora played host to an Usawa Festival (“Equality Festival”) pulled together by Kenya’s greatest hiphop star Juliani along with grassroots groups working to build up strength from the ground up. Across the world, similar festivals and rallies brought people together to demand change and build their power. Attendees at Davos complained of being trapped in fog, stuck in ditches, and almost buried by heavy snow. At the Dandora garbage mountain, in contrast, the sun shone, the participants sang in joyful defiance and people took the initiative for change into their own hands, said Phillips. “We are the people we’ve been waiting for!” they shouted. It will take time, they said, but from the garbage mountain top they felt, in an echo of Dr King and of the captives who ran from the Pharaoh, that they could see the promised land, declared Phillips. I read a series of short articles by Davos leaders recently, and it ws totally a snow job. That they embraced Trump shows how ridiculious Davos and its ilk are. Trump is the best POTUS since Regan and may even turn out better then Regan! Finally a POTUS who puts the USA first!